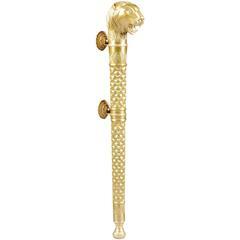 Bronze Door Pulls by Forms and Surfaces. 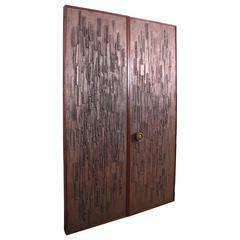 A wildly amazing Mid-Century Modern door by Sherrill Broudy for forms and surfaces, circa 1960, a grandiose bonded and poured bronze door in an abstract Sunburst design. Monumental and stunning, this item comes from deadstock and has never been used, so it is in pristine condition and ready to pair with your selection of door handles. 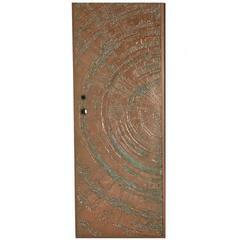 Absolutely stunning huge double sided bronze resin doors. Designed by Billy Joe McCarroll and David Gillespe for Forms+Surfaces in the early 1960s. Original doorknob and hardware. 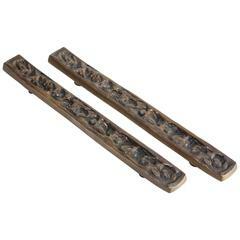 Heavy bronze brutalist deep relief pair door pulls attributed to architect Sherrill Broudy and sculpture Joy Verner. Stamped on the back H9.